If you’ve been following my recipes for the past year or so, you’ll know that I have a “thing” for rice krispie treats. For 38 years, I only ever made plain rice krispie treats until – BAM – I discovered that I could add different ingredients and flavors to make all-new, totally unique treats. It has changed my life. 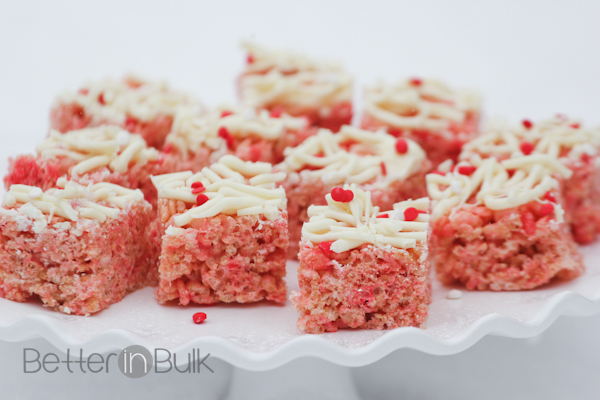 I had an idea for a Valentine’s Day-themed rice krispie treat using Jell-O as the flavoring (I should have known it had been tried before….but I swear, the only other pink rice krispie treats I’d seen before had used pink marshmallows. Yes, I thought I was being unique here…). 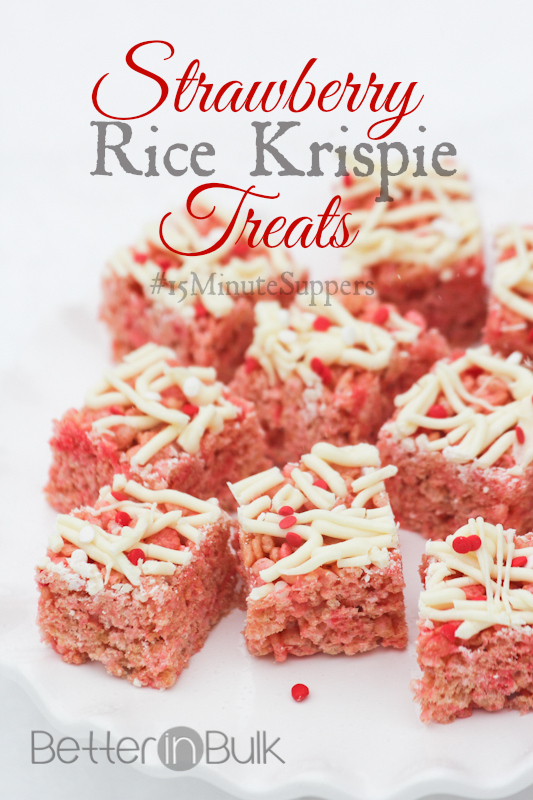 You will be amazed at how easy these Valentine’s Day rice krispie treats are – and how different they taste with just a small addition. They are definitely one of our favorite variations now! Melt butter over low heat in a large saucepan. Add marshmallows and stir until completely melted. Remove from heat. Add rice krispie cereal and sprinkle with Jell-O. Stir until well coated. Press mixture into a 13 x 9-inch pan sprayed lightly with cooking spray (I like to use a large piece of waxed paper). Melt white chocolate chips and drizzle over rice krispie treats. Add sprinkles if desired. Let cool completely (if you can). Cut into squares and serve immediately or wrap in plastic wrap to keep moist. Refrigeration not recommended. What a cute idea – and I never would have thought of using jell-o powder for the color (and flavor). Very nice! An oldie but a goodie and a tweak for Valentines Day with the strawberry red. 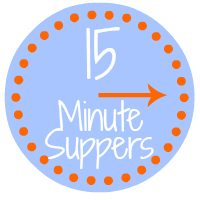 Thank you for coming to the Inspire Me Monday linky party. So cute! Going to try these. Do you think it would work with other flavored Jello? I’m thinking blue and green for high school colors. LOVE the beautiful background the snow made for the photos!! So pretty. And the krispie treats look great, too! These look so good! My family would love them I’m sure. Oh very cool. My kids would go nuts. These look so cute and oh so yummy! I have had a few variations from the original rice krispy treat but have never made any. I want to give this one a try. How festive! I haven’t had a Rice Krispie treat in a long time! Love the shade of pink they get with the Jell-o. Adorable! These are so cute! I was wondering how they became pink – now I know! 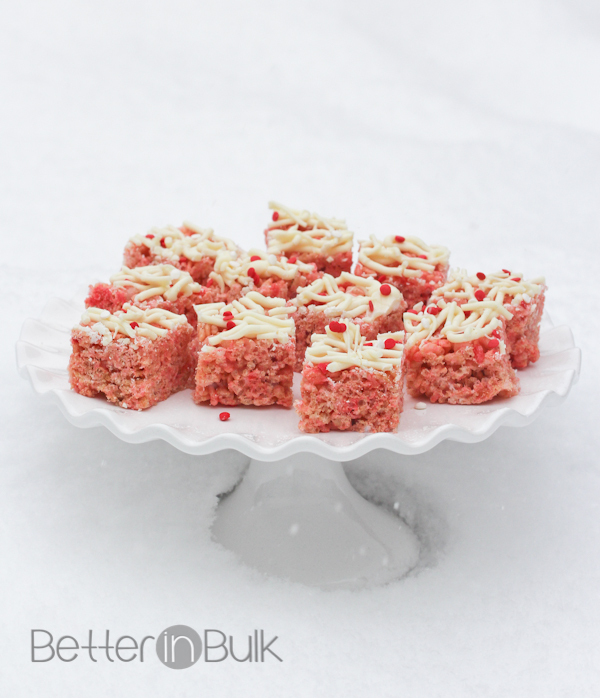 I can hardly wait to make these, as I love giving pink treats away for Valentine’s Day! I’ve been making red fabric flowers and am starting to give a few away to disadvantaged women/teens, these treats would be perfect, too! I swear I am still in plain rice krispie land. I LOVE these. They look so yummy. I think I will make these for our Valentine banquet at church.